The School of Love | Welcome to Prints on Purpose! Over the past several weeks, we’ve been focusing on the Life School aspect of your Soul Psychology. We’ve looked at the School of Peace and the School of Wisdom. This week, the School of Love is on the docket. 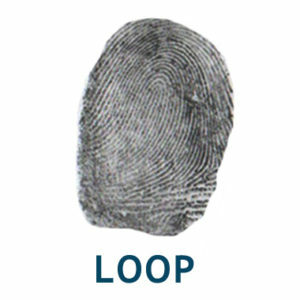 The fingerprint pattern associated with the School of Love is the loop. If you have at least eight loops in your set of ten fingerprints, this is your school. If you’re in the School of Love, you’re here to learn to become fully present to all of your feelings, regardless of what those feelings are, so you can work with them. When you can accept yourself and your feelings, and develop the ability to communicate them authentically and appropriately, you find the closeness, love and connection that you deeply desire. What are some of the challenges in the School of Love? You may have a hard time recognizing and identifying your true feelings. You may judge your feelings as ‘good’ or ‘bad,’ and/or judge others’ feelings using the same good/bad yardstick. Feelings actually aren’t ‘good’ or ‘bad,’ they just are. If you judge them, you are likely to try to bury them—which means burying a part of yourself. In order to work with your feelings, it’s vital to honestly experience them. You may withhold your feelings from others, stoically (and unreasonably) waiting for them to guess what’s going on with you. (“If you really loved me, you’d know how I feel…”) Conversely, you may indiscriminately share exactly what you feel at all times in all places, without regard for how appropriate that sharing might be. I had a classic experience with that ‘appropriate’ piece a few years back. A couple of my friends took a lot of pride in their open, honest relationship, and their ability to ‘tell it like it is.’ But they missed the fact that the communal dinner table wasn’t the place for a frank discussion of an issue that really belonged in their own private space. The airing of their feelings, at full volume, had the rest of us cringing in our seats. So there’s a need to be sensitive to what you’re saying, where you’re saying it, and to whom you’re saying it! How about you? Are you willing to take the emotional risk of authentically and appropriately expressing your feelings? Do you tend to ‘stuff’ your feelings, or are you more inclined to ‘let it all hang out’? How has that impacted your relationships? This entry was posted in Hand Analysis and tagged Connection, Decode, Life School, School of Love, Soul Psychology on June 22, 2016 by Donna Mills.